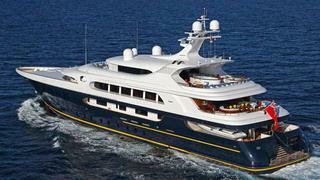 A call to Camper & Nicholsons confirms that Alex Lees-Buckley has signed the 65m motor yacht Pestifer for sale. Designed by Clifford Denn and built by Feadship in 2010 to Lloyd's class and MCA compliant, she accommodates 12 guests in six staterooms and includes a sauna, gymnasium and elevator serving all five decks. Twin 2,360hp MTU engines give her a cruising speed of 15 knots. The price of Pestifer is available on application.